It’s now late May/Early June and the pear grafts I did for the last post are growing well and preparation needs to be done to protect them from breaking out. If all goes as planned, the grafts will grow quite a bit this year and the graft union usually isn’t strong enough (especially with a bark graft) to support all the growth when the wind blows. We had a good take, all the scions are growing. They could grow four to six feet in the first years growth, thats a lot of stress on the union. Some people nail supports to the tree and use twine or green nursery tape (my preference) to secure the new limb to the wood support. Instead of nailing in to the tree I tie the supports to it with twine. 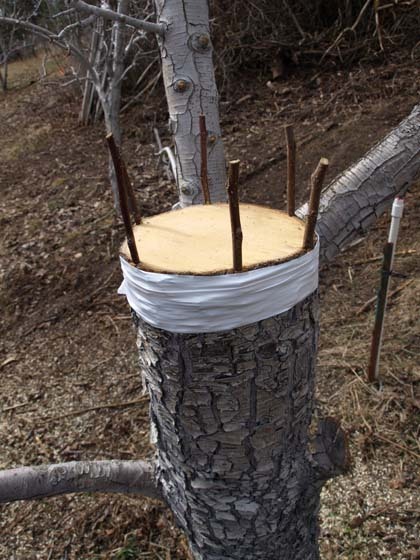 Figure which direction you’d like the graft to generally go, with the support (I use bamboo poles, 1″x 2″ wood or metal electrical conduit or tree branches will do) against the trunk and then tied around the tree to secure it, then tie the grafts to the supports, easy. I like to leave the supports for at least a couple of years while the graft union grows and strengthens before removing the supports. 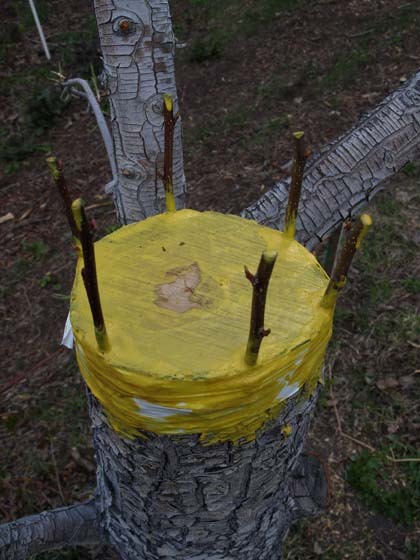 Sometimes if, if the growth is strong, the new limbs will set fruit on the second or third year, heavier supports may be necessary for a season or two. Generally after four or five years supports are no longer needed. We’ll start with grafting a pear tree. We decided that after many years it wasn’t very productive for all the years and inputs we put in to it, so graft it over to another variety. This tree is on the big side of what I’d recommend doing, but it can be done on bigger trees, but it’s more effective on smaller diameter trees. The main problem with doing big trees, is that with that much wood exposed, it has a higher probability of rotting until the grafts grow enough enough to cover the wound. On a smaller tree that might only take a season or two, depending on how well the graft does, vigor of the under stock, aftercare etc. But hopefully this will get the point across so it can be applied to varying diameters of trees. As I’ve said before, grafting is a fairly simple and straight forward process, but it can be dangerous. The knives need to be very sharp and you have to cut through the wood with a fair amount of force, and restraint, and NOT cut yourself. It’s not hard for me to imagine seriously cutting or dismembering a digit, So: SAFTY FIRST!! Always cut away from yourself and know where the knife you are in relation to each other. The following pic is how I learned and has proved safe for me and many other grafters for years. 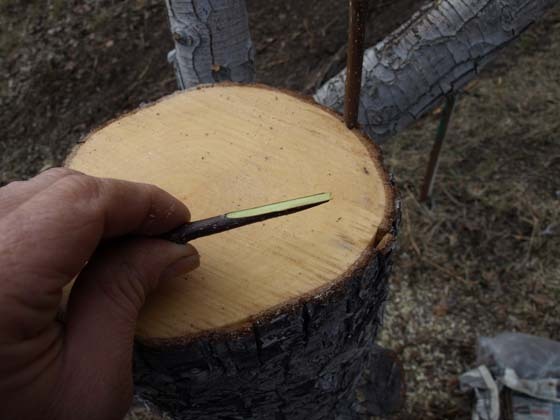 On to the grafting: First you need to make the saw cuts and clean up the prunings, I recommend a fresh saw cut before proceeding . 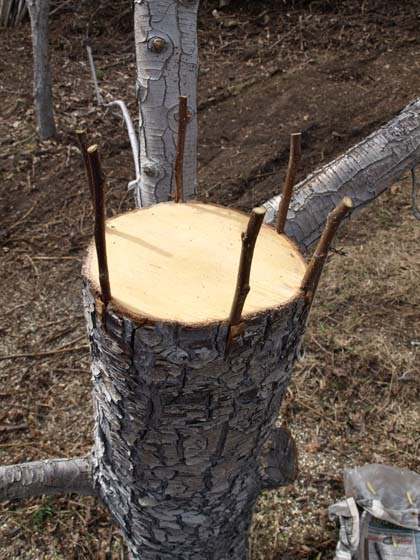 If you’re doing big tree, you can cut it down well before you graft, but leave the intended limb long and cut to the desired spot just before beginning to graft. Look for as smooth and straight a section to facilitate the process. 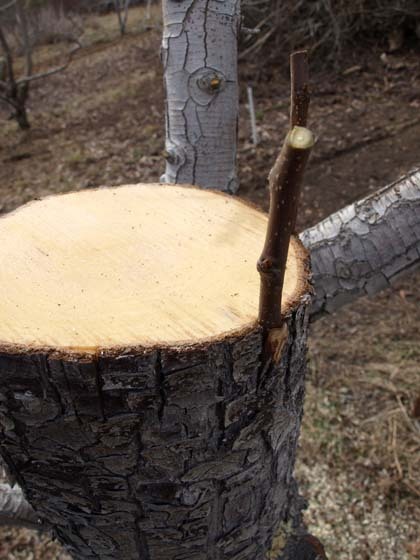 This graft is called a Bark Graft, you need to wait until the bark is ‘slipping’, this is when the bark easily peels away from the wood, usually late March to early April here (North Central Washington State, USA). 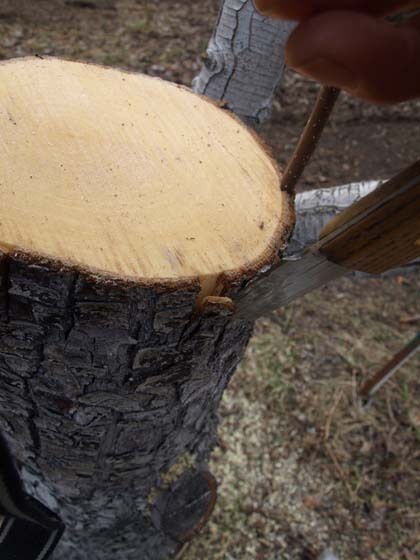 Make two vertical cuts through the bark about the width of the scion wood you are using, if the bark is slipping it’ll peel right off the wood. With bark this thick and somewhat crusty it takes a bit of force to get through it. This cut is made with the bark knife, made from a Old Hickory type kitchen knife that has all but about 2 to 2 1/2″ cut off of it (check out the image in my previous post). 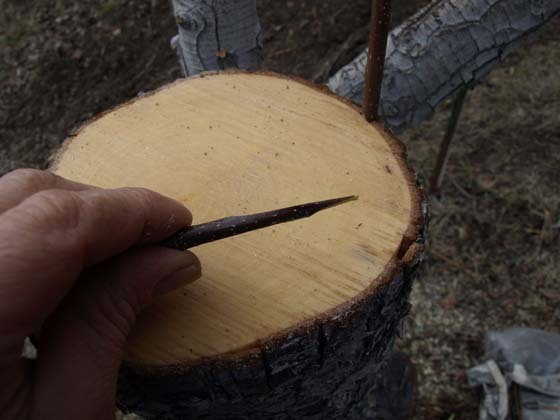 I put scions about 3″ apart around the circumference of the tree, this helps to bring the callous around to begin the closing up of the wound. 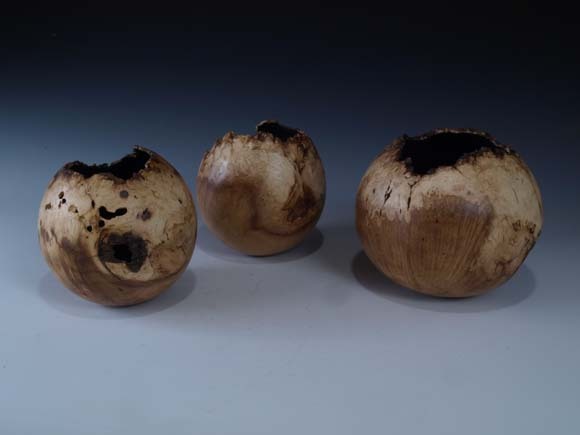 The above photos show how the scion looks after it’s cut, ready to be inserted into the cuts on the tree, or under-stock. As I mentioned earlier, you want a nice smooth, flat cut to achieve as much contact between the scion and tree as possible. The above pics show the scions inserted and ready to wrap and paint. Notice the small ‘half moon’ portion of the scion cuts sticking just above the surface of the wood. 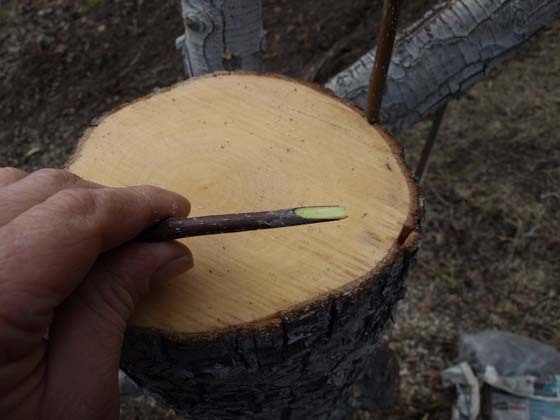 To finish, the grafts need to be wrapped to secure them and hold them tight to the tree. Make sure there are no gaps in the taping and that it goes a bit below where the cuts start, to insure it won’t dry out. 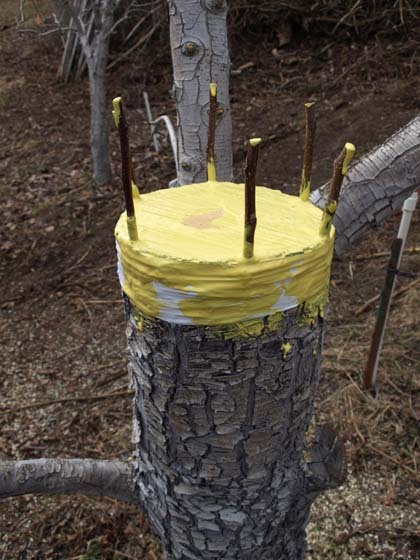 Then the paint, apply liberally around the scions and across the top of the tree, on a bigger tree we usually leave a unpainted spot in the middle in case it gets hot early and sap begins to flow, it gives it a place to escape. Push the paint down into the cuts and goop it a bit around scions. This paint works best in warm weather, it dries fast and smooth and elastic. In colder temps it can get a bit chalky. When ever you put it on, I recommend coming back in a day and re-apply to cover any cracks which may and likely will develop. Also, cap the scions with a dab of paint, but don’t cover the scions with paint, they’ll won’t breath and it ends up rotting them. They will begin to show some action in a couple of weeks. Depending on how fast they grow, in late spring to early summer aftercare is important, to secure the the new, tender growth so the wind doesn’t blow them out. I’ll post more on that later. 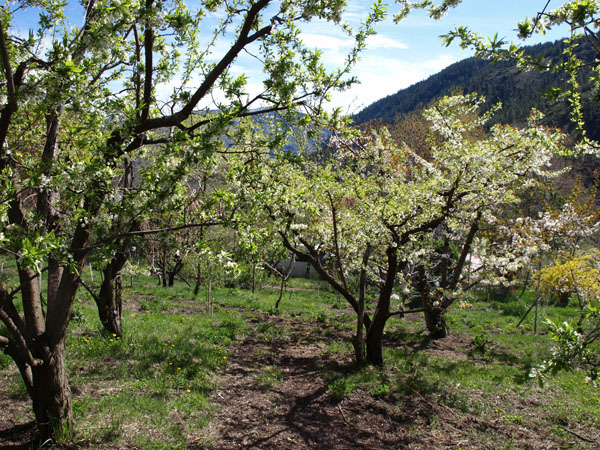 With most newer apple orchards, the trees need to be staked up because of the dwarfing rootstock they’ve been grafted to can’t support a fruit laden tree. 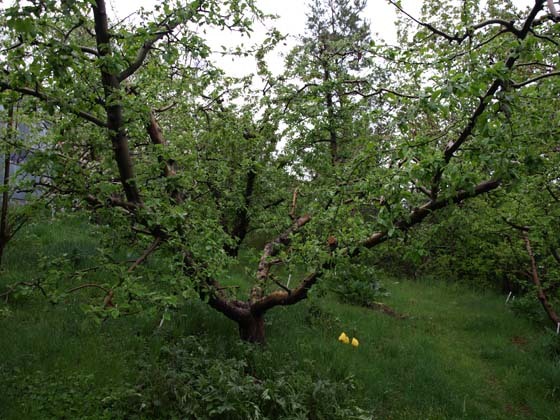 In the old days (1970’s and before) all apple trees were grafted onto seedling rootstock ( as it sounds, plant a seed, grow for a year then graft the desired variety on to it ) which will make a full size tree with out need for staking. * For clarity: A rootstock is what a cultivar (Fruit variety, i.e McIntosh, Jonathan etc.) is grafted or budded to a few inches above ground level making it the tree. 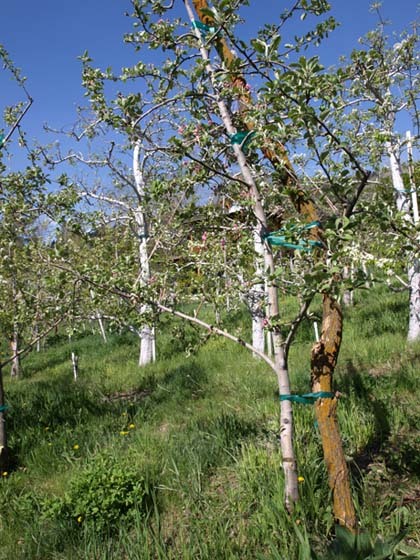 All orchard trees are grafted, there’s too much genetic variability in a seed to expect to get the same fruit from planting a seed of the variety. 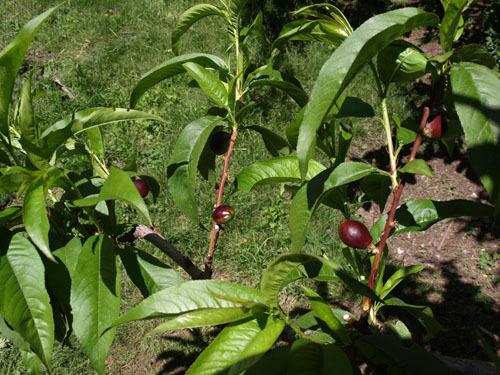 Research and development on dwarfing rootstock have been going on for many years, but the common use of dwarf and semi dwarf trees for 30 to 40 years. The advantages of using dwarfing rootstock are that the trees are smaller, they come in to bearing sooner and are easier to manage. 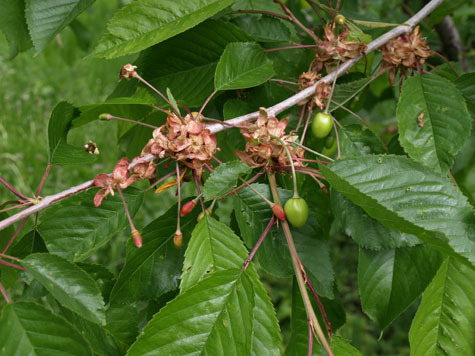 The disadvantages are they may not be as winter hardy, they need support, and are generally more susceptible to disease and variations in soil and climate. 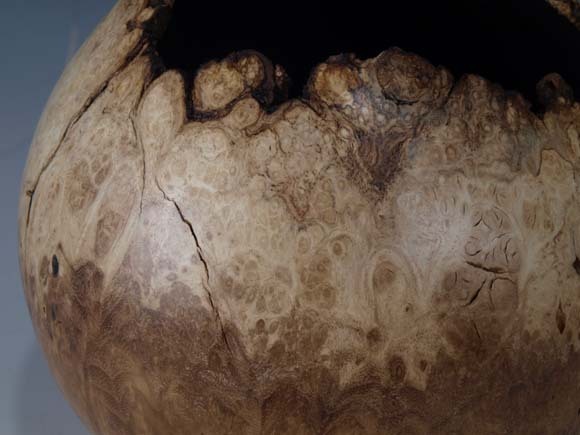 What does all this have to do with Black Locust you may be wondering, read on. When we started here, we planted a handful of apples on seedling trees and the rest on Malling 26 rootstock, a semi dwarf which needs support. 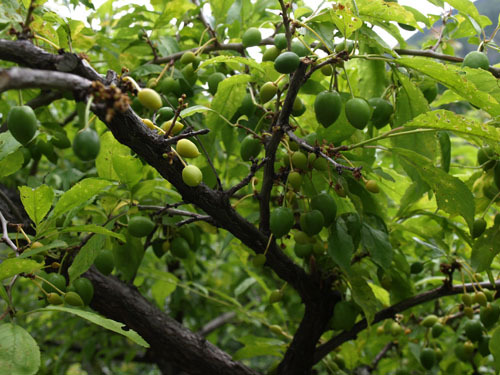 It produces a tree about 10′ to 15′ tall and can be kept shorter with pruning. 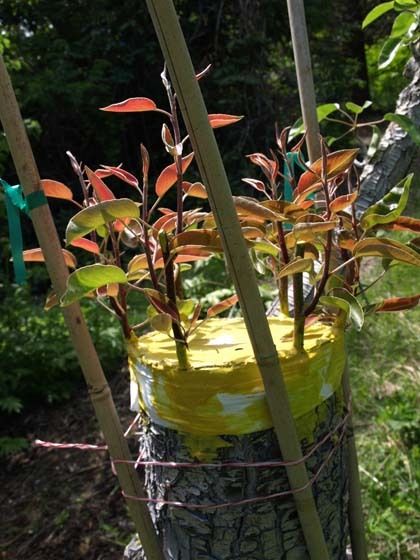 When we planted we used pressure treated 2″x 2″ wood supports ( P.T. 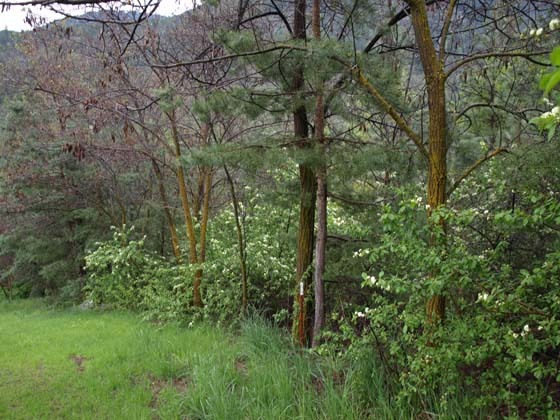 wood was allowed by the WSDA (Washington State Department of Agriculture) Organic program, but has since been disallowed. The posts were far too small to hold up a mature tree with a load of fruit, and many have rotted at ground level so to replace them means using some kind of steel support or Black Locust! 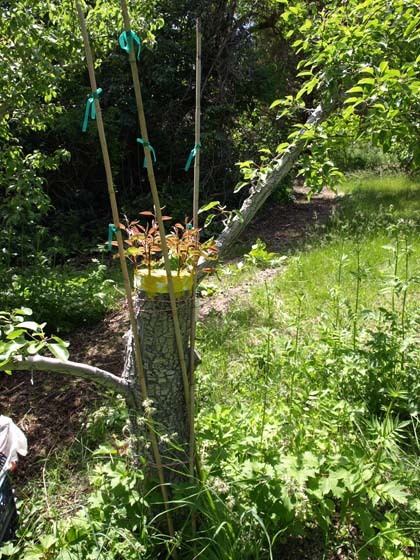 Another planting we did on our place when we started was with Black Locust trees, I call it my thorn orchard. The wood is known to be strong and rot resistant, which makes it great for fence poles or tree stakes. It’s not native here ( North Central Washington state) but grows well almost everywhere, too well in many locales, it can become a pest. The trees are thorny and spread easily especially if the roots are disturbed and it readily sprouts when cut (renewable). 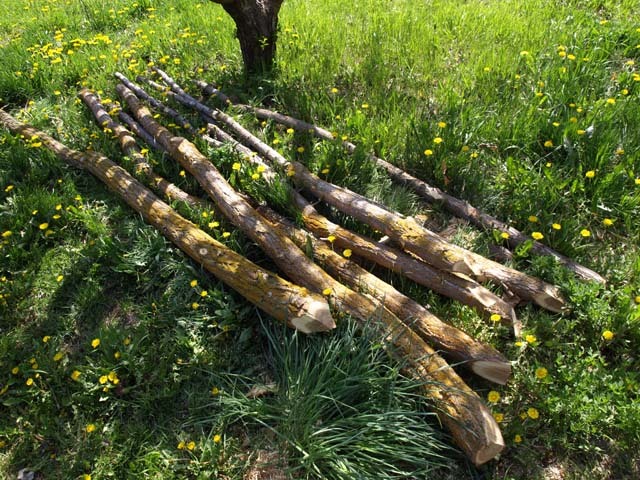 It works well for us, being a small operation, to use Locust poles to replace our decaying tree stakes, not so much for bigger orchards unless a commercial source of Locust poles were available. So easy, plant trees, wait 20 years and then harvest poles! Black Locust is an extremely hard, durable and beautiful wood which has many uses besides poles and firewood. Myself being a woodworker I’ve been fortunate to come across Black Locust wood and burl which is great to work with. 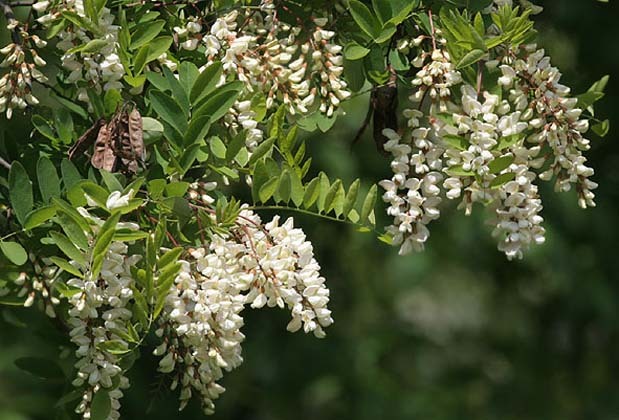 More benefits of the Black Locust are its fragrant, nectar rich blossoms each spring and it fixes nitrogen in the soil. June is when we thin the fruit on the trees here in North Central Washington. You can pretty much tell which fruits will drop and which will stay ( I mentioned June drop in a previous post). This plum variety (Santa Rosa) is set very heavy, as is usual for these trees of ours, amazingly year after year. 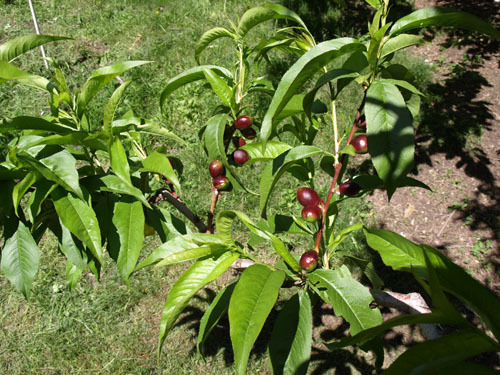 ( Most of our other plums don’t have much fruit on them this year, as a result of poor pollination) So there is still much thinning to do on it, to space out the fruit so they’ll size up to a desired proportions. Its too easy to under thin, I usually have rule of thumb or hand and try to go about 6 to 8 inches between fruits (do the Hawaiian hang loose sign, basically the space from thumb to pinkie). Its always difficult to tell when the fruits is so small, I try to imagine what it would look like with full size pome hanging there, to gauge my progress. Every year I tell myself “make sure & take enough off”, and I think I do but when I come back to pick I wonder if its even been thinned. So I’m resolved this year to thin everything twice to make sure theres less I miss. I usually do a fair job, but there are always clusters that are missed and fruit invariably under thinned. When a tree has a heavy fruit set, probably 95% of the fruit gets thinned off, so its a bit disconcerting to see all the fruit on the ground. But if it wasn’t done you would end up with loads of real small (marbles) fruit. Its discouraging to see all the fruit there isn’t, but we’ll have to wait and see for sure after the June drop. It seems like it always some version of this, the weather having its way with us! Once again its so good to have a mix of fruits to help insure we’ll get some harvest. Many trees, not just fruit trees will make a heavy fruit or seed crop one year and not so heavy or blank the following year. It takes a lot of energy to produce a crop that often the tree needs the next season off of fruit/seed production to recoup its reserves. 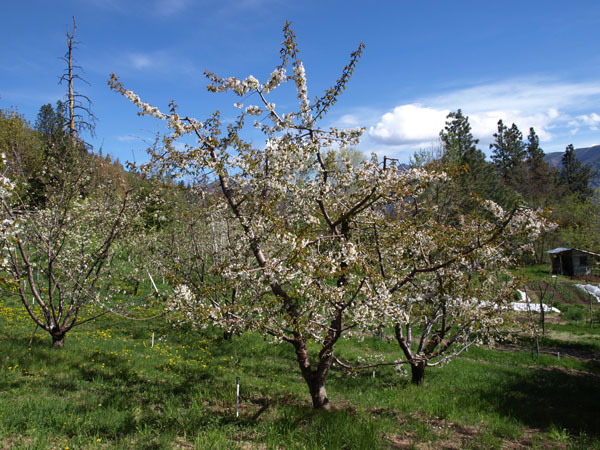 One of our spring chores is to thin the blossoms of the apples, they seem to be the main fruit we grow that benefits from this practice. Some varieties such as Gravenstein, Tydemans Early Red, Gingergold, Honeycrisp, Galas and others are particularly prone to biennial bearing. Blossom thinning is a time intensive process and can be tedious and mind numbing after a few hours! But its also quite nice especially if its warm and the bees are buzzing and the sweet fragrance of apple blossoms fills the air. 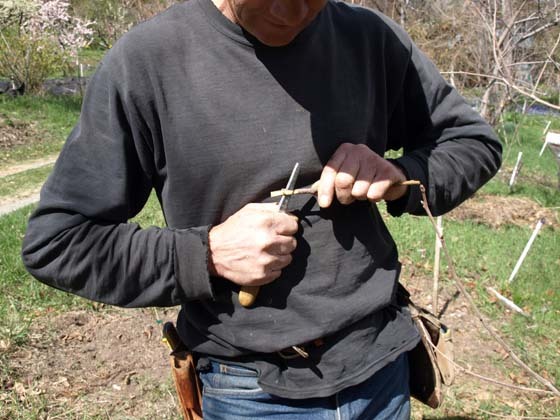 We mostly use our fingers to pluck the blossom cluster off, although sometimes we use our Felcos (hand pruners). My method is to consider each blossom cluster as a fruit, and thin the clusters about the same distance I would when I thin the small fruits in June, about six to eight inches apart. We can do the work by hand here because our place is small and apples aren’t the only thing we grow. 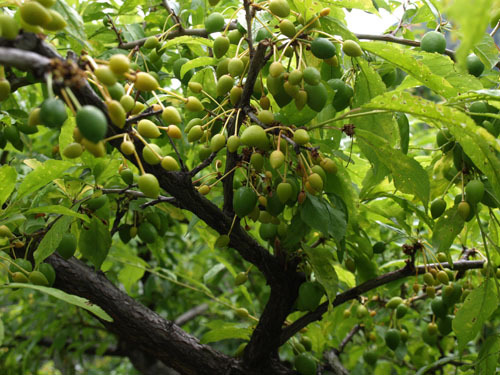 Bigger conventional orchards use chemical thinners and organic growers generally use lime sulfur and fish oil during bloom. The idea is to kill off many, but not too many , blossoms to ensure a return bloom next year. Its tricky, you don’t want to do too good a job, because you never know what the rest of the spring will bring i.e a killing freeze ( this goes for hand and spray thinning). We’ve had great success over the years with return bloom, even on notoriously difficult cultivars, but we do have a couple of varieties that don’t seem to respond to blossom thinning at all. Even though we also thin the fruit in June, the time is past when even heavy thinning then won’t bring a return bloom. It needs to be done in a timely manner just before to a week or two after full bloom. Its been cold and windy for the last two weeks, seems like the bees have been out a little but not much. 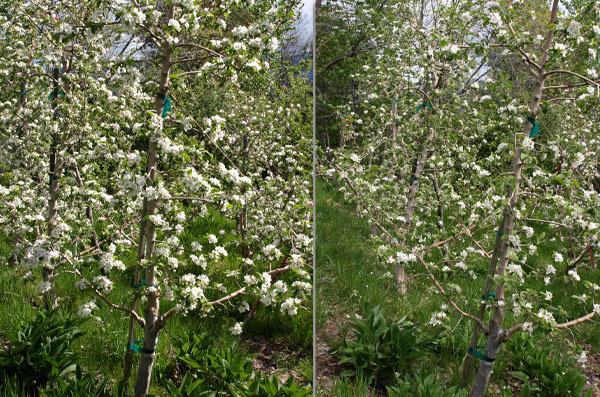 The pears and apples are coming in to their bloom period with the soft fruits blooms pretty much done. As always this time of year, we’re hoping it all works!